Yesterday I started to manage the @TribuneAgency account again. 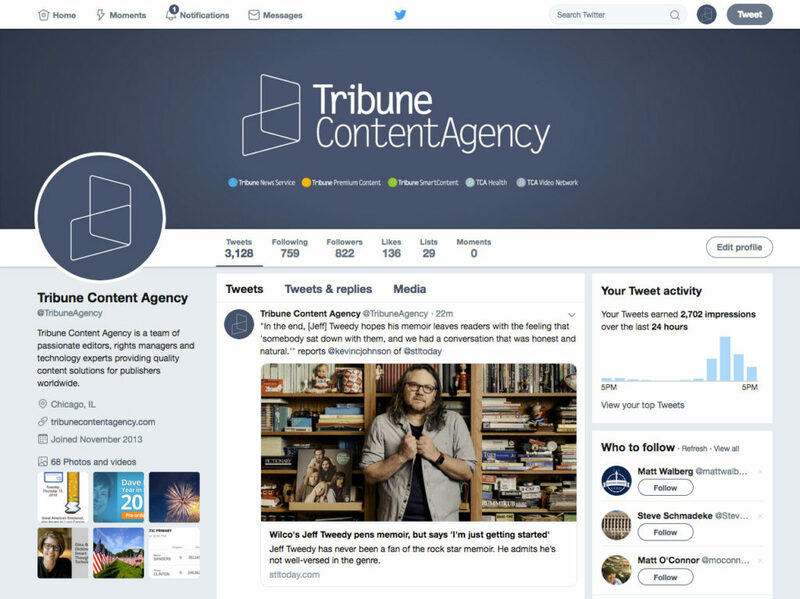 This is the Twitter account for Tribune Content Agency. We are the branch of Tribune Publishing that syndicates and licenses content from all over the place. I created the Twitter account in 2013. I ran it for a couple years, then some of my coworkers ran it. Now I’m back running @tribuneagency. We have sooooo much content that we publish. I’m trying to streamline the process with the account. It’s incredible the amount of content. I still need to rewrite our twitter bio to make it more enticing, because TCA really holds a unique position in the industry. We collect together ALL these columnists, ALL these cartoons, ALL these magazines, ALL these newspapers. Some rough numbers: About 150 columnists, 25 comics and editorial cartoons, 20 magazines, and about 70 newspapers. (That becomes 600 newspapers we cover when we consider our larger contributor pool.) And then add on top brands like Harvard, Mayo Clinic, Kiplinger. I absolutely LOVE going through all our content, picking items to tweet, finding interesting pull quotes. Our content covers quite a range of sources. I’m totally invigorated at work diving into all our content. It’s terribly exciting. Seriously. Please, give @TribuneAgency a follow. Thank you!